Come and ride with Two Tyred Tours for a weekend or a week. We organise private - "bespoke," active cycling vacations for small groups (eg. friends, family, co-workers or celabrations), who want fantastic bike rides, great food and outstanding wines. Our "fully van-supported" cycle tours are tailored to your ability, budget and experience. None of our trip itineraries are "etched in stone." That means we help YOU create your very own active bike vacation in the region and country of your choice, based on where, when and how much you and your group want to ride. We have been organizing cycling vacations for 20 years in Switzerland, France, Italy and Austria and our route inventory is massive! The trips below and on our website are just samples of what we can organize for your group. Our group size is small; from two to fourteen riders. The way we work is this; your group shares the overhead costs, meaning the per person trip price will vary depending on the number of participants. You can choose between nice two stars, three stars or luxury hotels, and all evening meals are included on most trips. Our formula also allows you to bring your own bike or use one of ours. TTT can also supply amazing Carbon or E-bikes on most of our trips. We also keep your time in the TTT van to an absolute minimum. Many tour operators have mandatory van transfers to ride starts and transfers to your hotel at the end of your ride. With TTT you can ride hotel to hotel - on your bike, not in our support van. The van however, is always nearby, so you if you choose to end your day early, you may. We have some outstanding rides waiting just for you. Call us for a quote or just click on the button below. Go on. ... or ... Torino to Monaco. The Cols are right out of the Giro and the TdF: Colle di Finestre, Agnello, Vars, Cayolle, Champs, Allos, Bonnette, St. Martin, Turini and Lance’s favourite training loop, the Madone! The scenery is a 10/10 and there is plenty of climbing. This truly amazing trip ends in the hills above the bustle of Monaco. 2018 trip prices starting at 2198€* for 6 nights. Tuscany is beautiful. You really should slow down and ride in Bella Toscana with TTT. You will see, smell and feel Tuscany better than anyone stuffed inside a tour bus or a rental car. We have seen the admiring looks for almost two decades of trips. Stunning cycling, food and vino. Plus, we have found some of the best “hidden” Gelaterias in Tuscany. 2018 trip prices starting at 2589€* for 5 nights. A carbon fibre race bike is included! Our biggest and toughest week; Geneva to Bormio, the long way. 1000kms, 23,000m ascent and 23 Cols in 3 countries and 4 languages. The easiest day is 3000m and 140k. 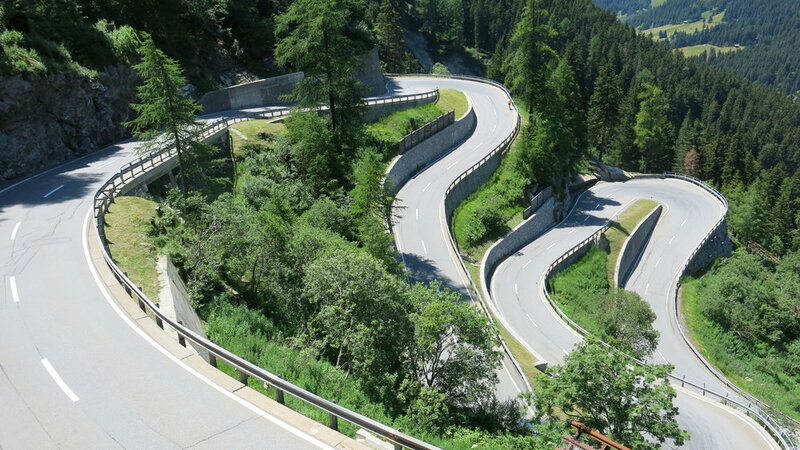 On the last day, you ride all three sides of the Stelvio. We can make this trip a lot easier if you wish, and stretch it out over 10 days, or we can make a lighter, friendlier and shorter version for you. 2018 trip prices for the big version starting at 2298€* for 7 nights. In a word, amazing! The riding, that is, and beautiful (weather too)! The island is split in half by the Serra di Tramuntana Mountains which are in the north. Our trip follows these and you ride east to west then back again. Low traffic volume and very smooth asphalt. Cap Formentor and Sa Calobra are the rides this week! 2018 trip prices starting at 2995€* for 6 nights. €* All prices quoted above are based on groups of 6. Prices will vary with smaller or larger groups. Beautiful hotels, great restaurants, an astonishing lack of traffic, warm and dry weather all equates to some of the best riding in Europe! Welcome to TTT’s Provence. This has been one of our favourites for years and also our client favourite. We have 3 types of trips in the region; leisure, luxury or a week including Ventoux. 2018 prices starting at 2200€* for 5 nights. This hilly trip is definitely not for the faint of heart as the roads are narrow, with some steep drop-offs, many switchbacks, unlit tunnels and over-hanging rock walls. The perfect trip to bring your mother-in-law for her very first European cycling vacation. Stunning scenery, and no cars! We’ve been looking for an area like just this ... for 20 years. We found it! 2018 trip prices starting at 1899€* for 5 nights. We take on the Sella Ronda, Giau, Fedaia, Campolongo and the daunting Zoncolan to name a few of the climbs. The Dolomite range is known for being one of the most beautiful mountain landscapes in the world having 18 peaks over 3000m in height. The Sud Tirol truly is a impressive region. 2018 trip prices starting at 2433€* for 6 nights. Mont Ventoux is a magnet for cyclists worldwide. We stay at the foot of the mountain for two or three nights (you decide this during our pre trip conversations). Near to Ventoux, there is the Suzette region and the Gorges de la Nesque, both will blow you away! Ride Ventoux once … you will never regret it. 2018 trip prices starting at 2150€* for 5 nights.